I am a dictionary hoarder snob addict aficionado. From an early age, I’ve enjoyed reading the dictionary. It’s amazing the words you learn doing that! I’m old school. When I wanted to know what a word meant, I had to hit a musty book with faded, yellow pages that crackled when you thumbed through them. You don’t get quite the same thing from Googling a word for its definition. While looking for the proper spelling or meaning of one word, you’re more likely to stumble across something interesting that you may not have known. A lot of people don’t realize that language is always evolving. Words fall in and out of fashion and spellings change over time as common use dictates. 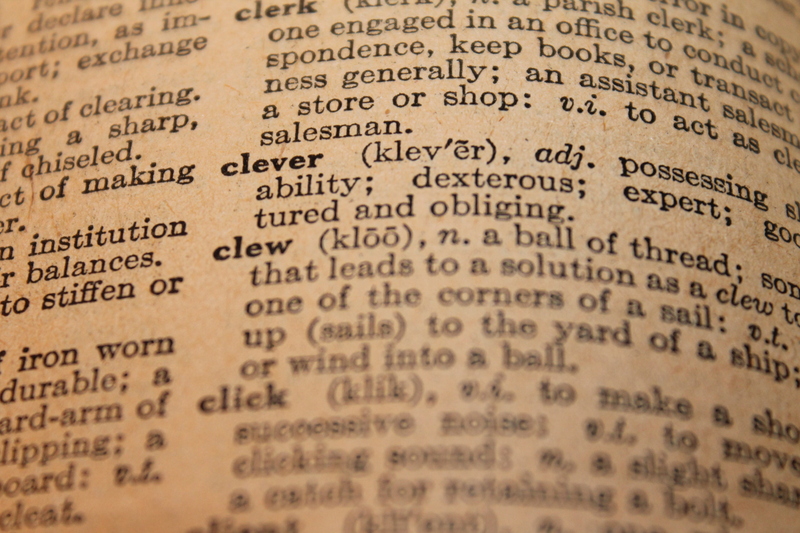 I feel confident that someday, the proper spelling of the word “definitely” will devolve into “definately.” Just as the word “clew” became “clue,” a fact I did not know until I found it in a very old dictionary that my mother used in her 1940’s era elementary school days. 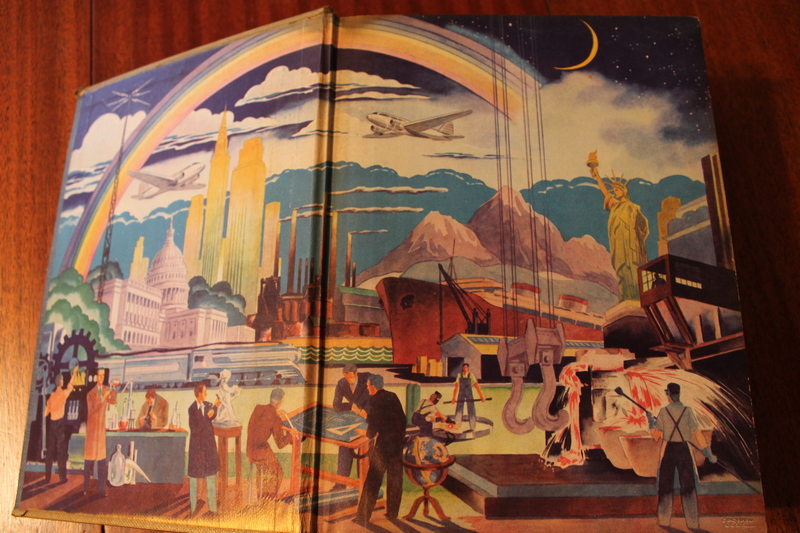 My aunt loved elegantly bound tomes and filled her home with them…after she spray painted them gold. When she asked me what I’d most like her to leave me in her will, I wanted her dictionaries. She had several, they were all very thick, and quite comprehensive. While reading through one such book looking for a synonym of “handkerchief,” I stumbled across the word I now use to test dictionaries. I do not consider a dictionary complete unless it contains this word. Seriously? What kind of geek has a word specifically to test dictionaries for completeness? Words are my stock in trade. My dictionaries are my warehouses. My thesaurus is my chop shop. The Chicago Manual of Style is my bible. These are the tools I use to do my job. It’s important vital that I have the best tools I can find at my disposal. The dictionaries I’ve found that have my word in it generally cost upwards from $100. If I’m looking for a word that I know is used in the English language, in the context I’m pretty sure it needs to be used, and I can’t find it in a dictionary, and that dictionary doesn’t have my test word in it, my default position is that I am right about the word’s meaning and/or usage because the dictionary in question is incomplete. Back in my newspaper days, I once argued with an editor over the use of the word “scurvy” as an adjective. Her argument was that it was a noun, which it is. Mine was in favor of its use as a descriptor. Her fallacious argument was based on the stand that it wasn’t listed as such in her $5.99 grocery store paperback rack dictionary as an adjective. Mine was based on the fact that I’d cross-referenced it through five dictionaries, published between 1830 and 1990, none less than three inches thick, and each containing my test word. Needless to say, I got to keep scurvy as an adjective, and I got promoted to copy editor. My love for dictionaries runs in the family. Another aunt painstakingly compiled the dictionary you see in the picture. 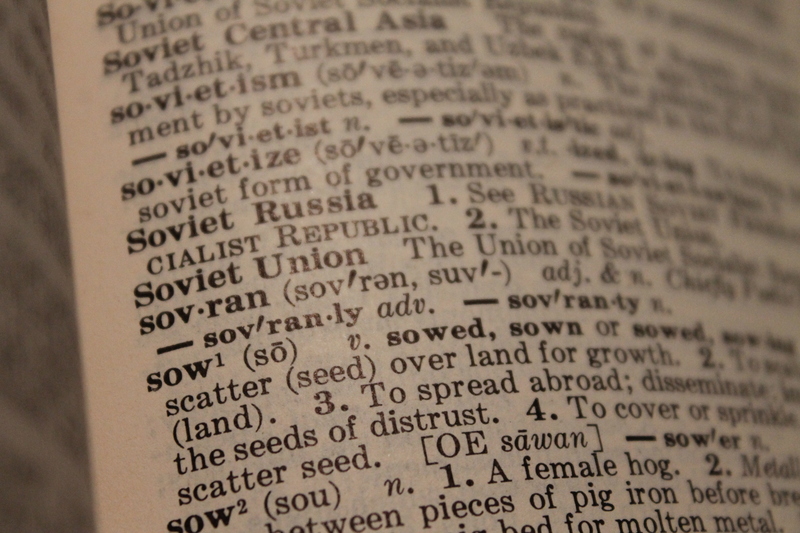 In the 1950’s, the grocery store gave away a comprehensive dictionary, one section at a time. 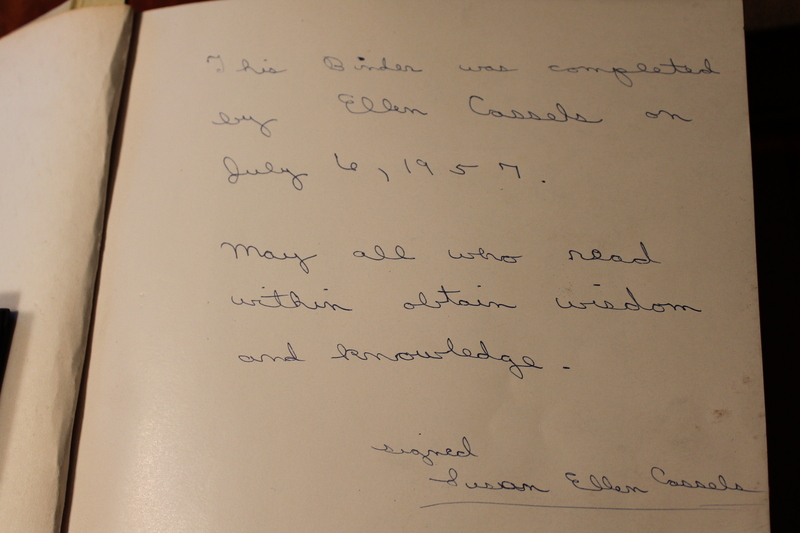 Then a teenager, Ellen (my dad’s little sister) diligently gathered the binder and each section. At six inches thick, it is the most comprehensive dictionary of my collection and my favorite. 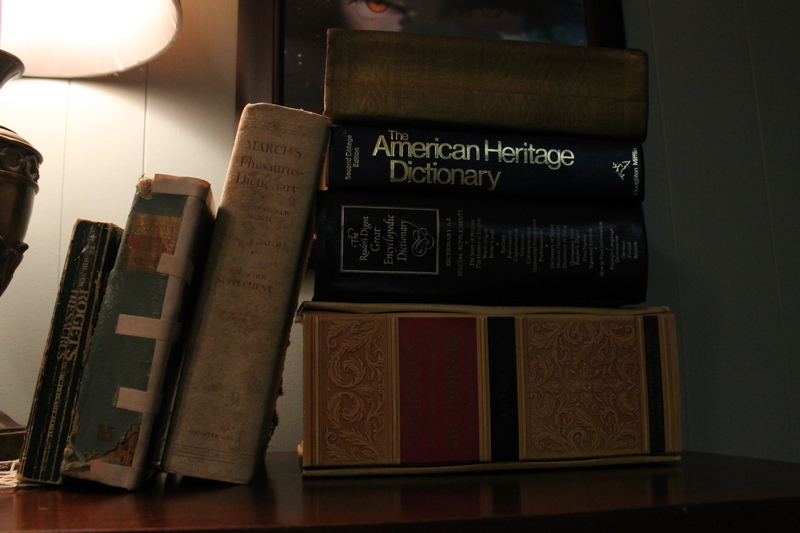 Other favorites include the three-inch-thick American Heritage dictionary my great-aunt-of-the-gold-spray-paint gave me for my high school graduation, the three-inch-thick dictionary I first found my test word in, and three or four gold-painted dictionaries printed before 1940. I have several more, including pocket dictionaries, drugstore paperback rack dictionaries and a few unexceptional tomes that well-intentioned friends and family gifted me with over the years. That’s kind of like giving Eric Clapton a plastic ukulele from the Walmart toy department. Sweet and funny, but pretty much useless. My husband also has a few, but after he produced them and I laughed scornfully, he took them to work and I haven’t seen them since. I did mention my dictionary snobbery, didn’t I? 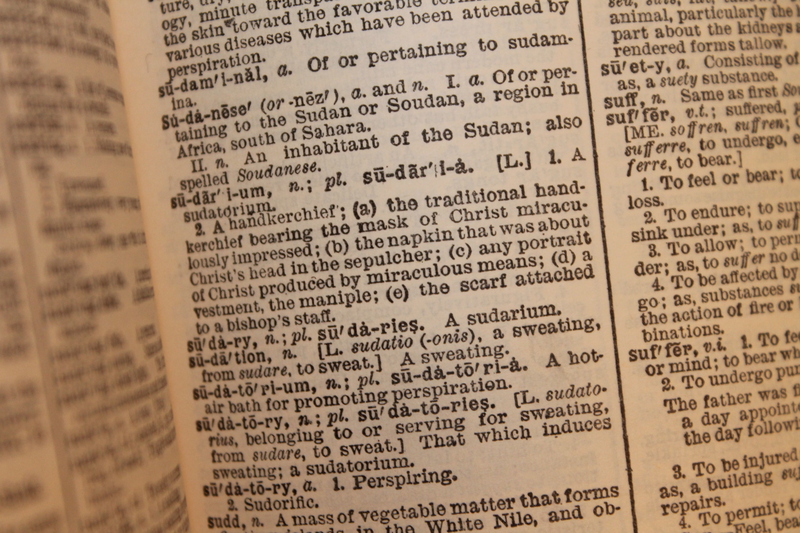 So when you’re reading my books and wondering how I came up with words like Sovran, janizary, Catarrh, tussah and wondering if they’re real words or simply made up, grab a dictionary containing the word sudarium and give them a look. You might find yourself privy to an inside joke or two. Guilty. One of the obscure definitions of the word “blade” is a swordsman. The name itself is a nod to Errol Flynn and the swashbuckling swordsmen he portrayed. Ok. That was not even the meaning I was thinking of. For just HOW many reasons did you choose the name ‘Blade’?! The more reasons I can justify a story element, the better!